The players gather on the pitch in front of the completed mural. Photo courtesy by Street Child World Cup. For 10 days the event exploded with energy as a whirlwind of activities took place. There was, of course, a big football tournament, culminating in the finals at Fluminense Stadium. But there were also music and dance performances, artistic activities, elaborate opening and closing ceremonies, a touristy trip around Rio, visits to a favela to interact and share with local kids and the creation of gigantic murals! You can imagine the cross-cultural potential when you have teens and their staff members from countries as diverse as India, Egypt, Kenya, Indonesia, Mozambique, the US, Brazil, Argentina, Pakistan, Burundi, Mauritius, Liberia, the Philippines, Nicaragua, South Africa, the UK, Tanzania, El Salvador, and Zimbabwe. The goal of this event (besides giving these kids the absolute time of their lives!) was to use sports and the arts to raise awareness for the plight of millions of street children around the world and call for an end to the abandonment of society’s most vulnerable citizens. Before the event began, I created a welcome mural in Vidigal, one of Rio’s most famous and artsy hillside favelas, so that when the kids came marching up the steep hill they’d have a surprise waiting for them. When they got to the top they spent time mingling with local kids, getting their first taste of capoeira and sharing various dance and musical traditions with each other. It was truly amazing to watch everyone interacting, not able to understand each other’s languages but really bonding and getting excited while learning new dance steps and songs. We created a mural in which a maternal figure holds an entire favela-style community in her hands with each participant painting a house with images and poems about their own hopes and dreams for the future. The largest mural, at the main event site called Lonier, was on a giant wall facing a football field. On dozens of hexagons (in reference to the football), the participants each wrote messages, poetry, and painted imagery relating to the themes of the event. Together, the hexagons made up 3 large figures; the first two were of an Indian male player and a Salvadoran female player. It also included, on the left side, an homage to Rodrigo, the captain of Brazil’s boys team who was gunned down on the streets of Fortaleza on his fourteenth birthday, only a month before he would have traveled to Rio for the Street Child World Cup, something he was greatly looking forward to. It was a tragic blow to his teammates and friends, who wrote messages to him on the wall, and a reminder of the extremely violent existence that these kids face, even when they have turned their lives around as Rodrigo had done. During one of Brazil’s games, the boys ran over to the image of Rodrigo on the mural after scoring a goal and bowed down in honor of him. Movingly, the Pakistan team then did the same in solidarity with the Brazilian boys. Then the Argentine boys, who had initially had a rivalry with the Brazilian, did the same when they scored. For those of us who were there, it was an unforgettable experience full of moving moments. During one match between the female teams from Indonesia and Tanzania, the Indonesian girls celebrated as Tanzania scored goal after goal— it was an uneven game due to Indonesia’s lack of experience– but the girls from both teams would jump on each others’ backs and dance and sing after every goal! Then the Tanzanian goalie allowed an Indonesian shot to go in, and the whole game erupted in joyous celebrations from all the girls and fans, a spontaneous outburst that reflected the spirit of the event. Afterwards the girls became close friends, inventing their own country called “Zimbonesia” with its own flag, and crying their hearts out as they hugged each other goodbye on the final day. Remarkably, this bond was born despite the fact that they couldn’t even understand a word of each other’s languages! Some may ask of this and other similar events: why use so much money, time, energy and resources for a couple weeks of sports and arts activities when there is so much need among vulnerable populations for life’s essentials: food, shelter, healthcare, etc. While no one is arguing in favor of organizing such events instead of providing food and shelter, it is important to recognize that there are many challenges that cannot be faced with these basic needs alone. Children are on the streets because they have been stripped of their basic human rights to have a life free from abuse and neglect; to have educational opportunities and safety; to be cared for and provided for. Their societies have allowed them to slip through the cracks. It is important to pressure governments to set up programs for these kids and to provide services in marginalized communities to prevent more children from suffering the same fate. Equally important, ordinary people must stop thinking of street youth as simply thieves and addicts, but instead begin to see them as victims of indifference and aggression on the part of the State, the police and mainstream society. A change in consciousness and a change in public policy: this is what Street Child World Cup and similar projects are calling for by way of high-profile, media-savvy campaigns that highlight the children’s humanity and bring attention to the issues they face. It also aims to bring street youth and like-minded organizations together to meet each other, connect and begin to build a global movement to achieve these goals. Dozens of news stories have been broadcast across the world by global giants such as BBC, Globo, ESPN and China’s CCTV as well as the event’s massive media team, bringing the stories of the participating kids to the masses. Many of the teams returned home to great celebration in their communities as well as on the part of elected officials and local leaders. The boys from Pakistan, who placed third, were received with financial scholarships for their education. The Burundi players, who represent both the Hutu and Tutsi ethnic groups who fought a bloody civil war, will tour their nation to advocate for ethnic harmony and reconciliation. In Durban, South Africa, policy was changed to prevent police from forcibly displacing homeless youth, and many officers became soccer coaches for street child teams through a program aimed at preventing violence and exposing the police to the kids’ humanity. These and many other examples show what concrete achievements can be made when people come together in common cause. 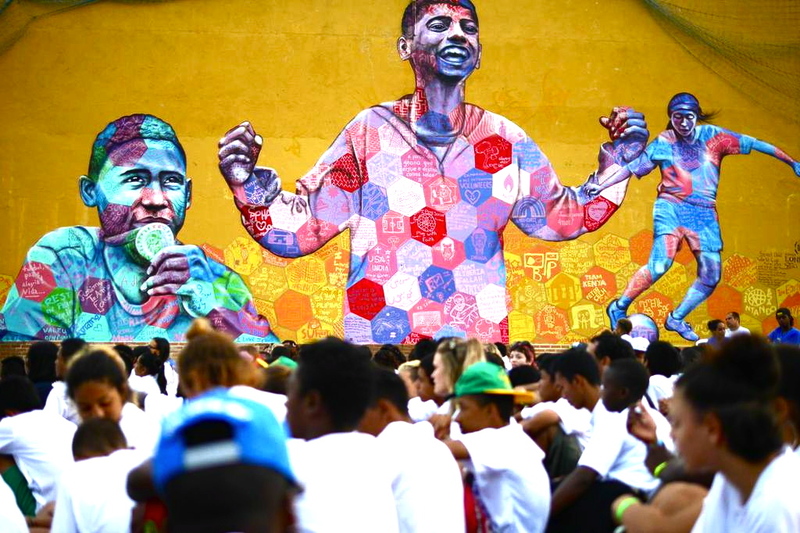 Hundreds of Street Child World Cup participants and staff from all over the world contributed their creativity to the mural: each was given a hexagon to design with words and imagery. 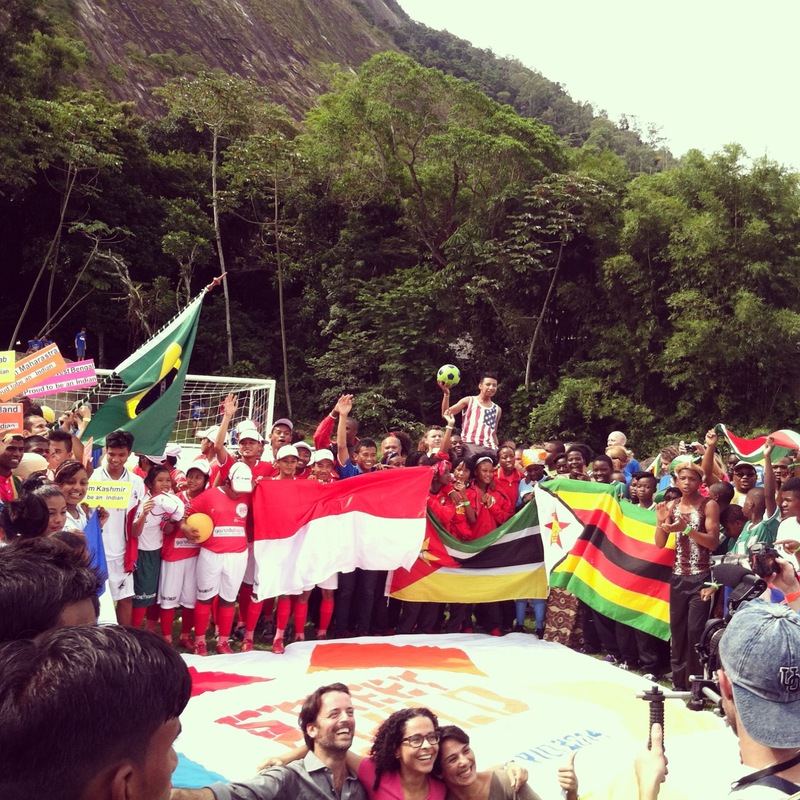 Photo provided by Street Child World Cup. Closing ceremony in Fluminense Stadium. One of the Egyptian players with his medal and certificate at the closing ceremony. 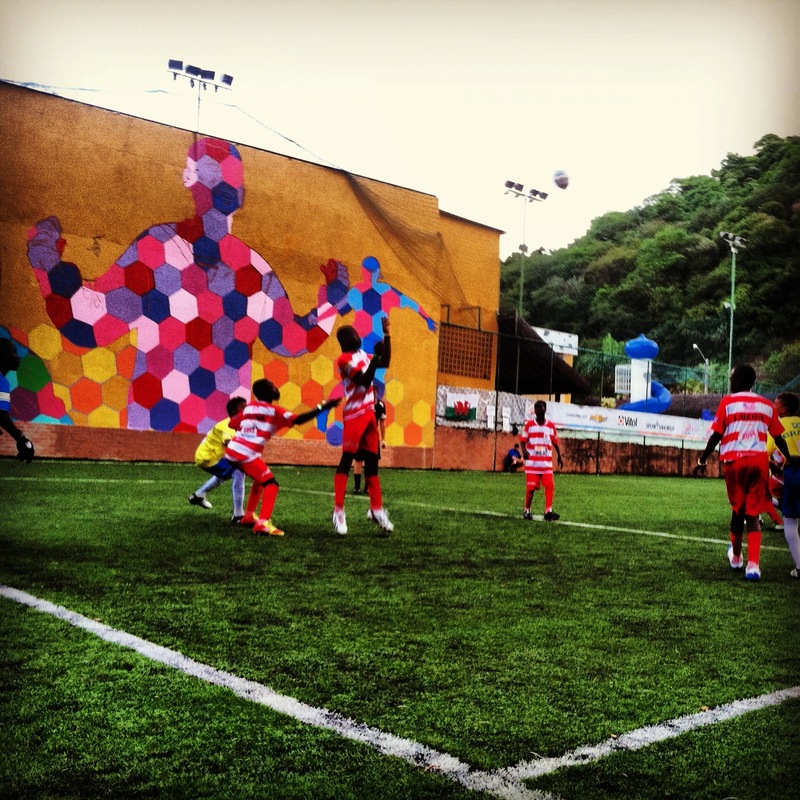 Rio de Janeiro, 2014: A motherly embrace of the community: Vidigal, with each house featuring the work of the local and international participants for the Street Child World Cup. Team Kenya players work on their hexagons. Local Vidigal residents introduce the international kids to capoeira. 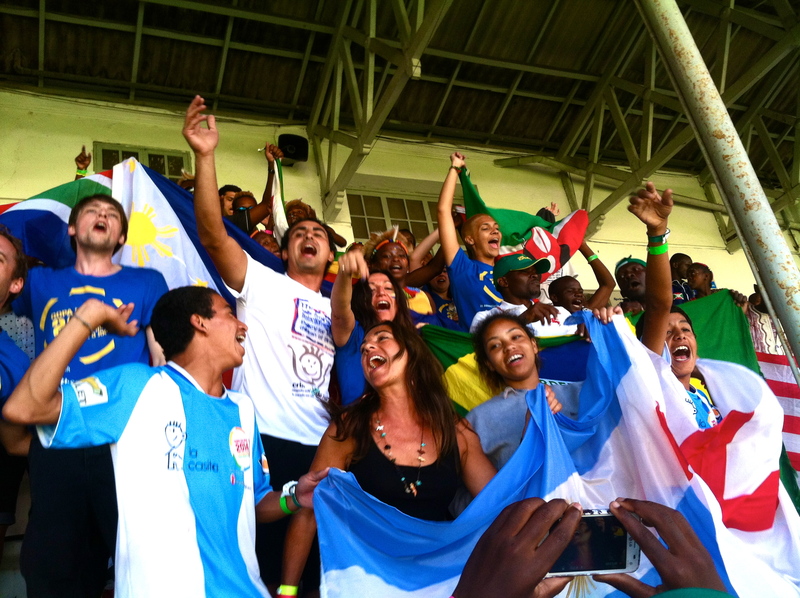 Team Nicaragua showing their national spirit! Team India playing the drums during the final match. 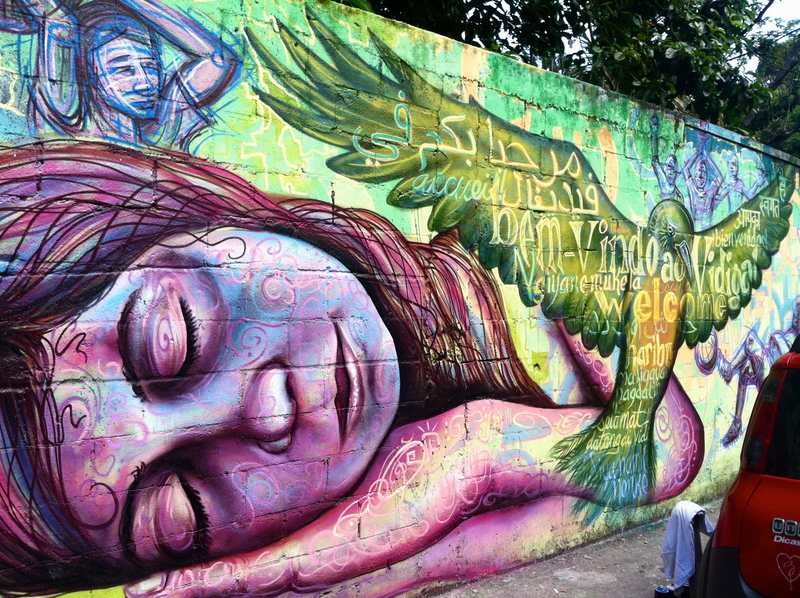 Rio de Janeiro, Brazil 2014: Created for the Street Child World Cup, this giant piece includes the work of former street kids from 19 different countries who traveled to Brazil to meet each other, play in a soccer tournament, participate in arts activities and raise awareness for the plight of street youth around the world. The figure on the left is Rodrigo, the former captain of Team Brazil who was murdered on the streets of Fortaleza on his 14th birthday, only a month before the event. His teammates and friends paid homage to him on the mural. The other two figures are youth participants from India and El Salvador. Each hexagon features the poetry, artwork and messages of the kids.